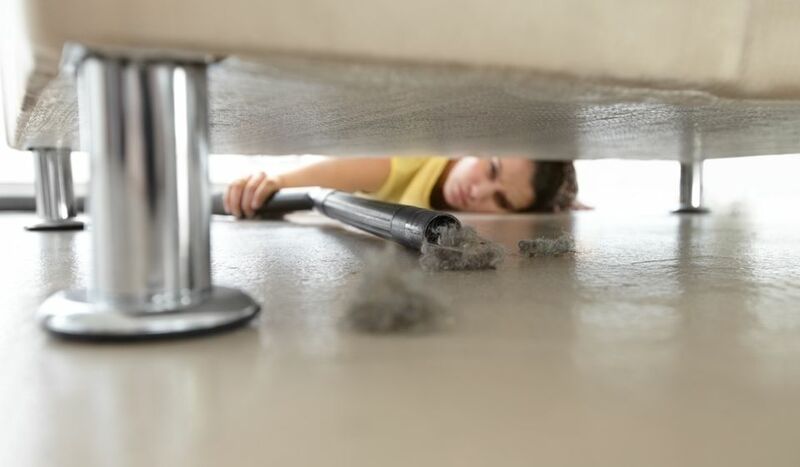 The space under a bed can be one of the handiest hidden storage areas in the home—if you make the most of it. The key to success is to keep it as neat and as tidy as possible. That means no dust bunnies, no crinkled up pieces of paper, and no dirty gym clothes. The best strategy is to store things under your bed in storage containers, and to make sure nothing is without a specific storage space. Before heading out in search of storage bins or boxes that fit under your bed, measure the width and height of the space. Write down the measurements on an index card that will easily fit into your wallet. This way, you'll always have it with you when you're out shopping. Look for long, low, plastic containers designed for under bed storage. Alternatively, you can also use canvas containers or even build your own custom wood bins on casters. The best bins have wheels (or easily glide) and open at each side so you can easily retrieve items from either side or end of the bed. Since under bed storage doesn't have to be pretty, you can use all those old cardboard boxes you have waiting around for something to do. Remove the top flaps so you can easily pull them out and see the contents at a glance. Similarly, you can use shoe boxes with the tops removed. Even better are larger boot boxes. 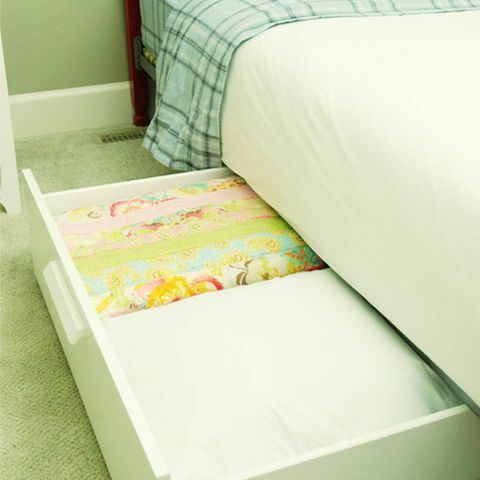 Consider re-purposing old dresser drawers to use for under bed storage. Luggage: You can also store things inside your luggage and just set them aside while you're traveling. Out of season clothing: Due to your bed’s proximity to your clothes closet this seems like a no-brainer. Don’t try to store anything bulky, like sweaters or ski jackets because they take up too much space. Linens: Keep your extra set of sheets and pillow cases right under your bed. Shoes: Store only your most-used shoes in your closet, and keep the shoes you wear less regularly under your bed. A lofted bed changes an under bed area from storage space to livable space. For a child’s or teen’s bedroom, this is the perfect place for a cozy desk setup or reading nook. In an adult’s room, you can tuck a desk under the bed, or you can use the elevated space to store all of your clothing. Think about installing a wide, deep set of drawers in the space where you can store all of your tees, sweaters, sweatshirts, denim, and out-of-season clothing. How nice to be able to roll out of bed and find your clothing right below you. A desk or work space is particularly valuable for those who live in studio or one-bedroom apartments. Just be careful not to let your workspace take over your sleeping space. It's important to keep them separate by storing your work items neatly. Don't let papers or files turn your bedroom into a cluttered office. Finally, remember that with a lofted bed, it's even more important to keep the space under your bed neat, tidy, and attractive since it's so exposed.